You are currently browsing the archives for the Chain Migration category. According to this article, Democrats are planning on committing political suicide. 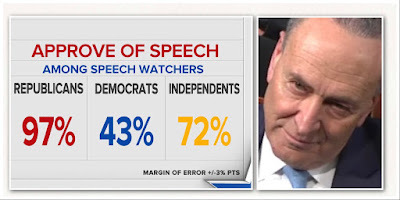 According to the article, “Senate Minority Leader Chuck Schumer opposes the immigration framework released by the White House — a potentially fatal blow for the prospective legislation in the closely divided Senate.” If Democrats oppose a bill that might give 1,800,000 DREAMers a path to citizenship, their ratings with Hispanics will drop precipitously right before the midterm elections. If that happens, the wave will be on. This time, though, it will be a red wave, albeit a small wave in the House. Think about this. Republicans would be able to run ads saying that Democrats unanimously opposed the Trump/GOP tax cuts that produced huge bonuses, tax cuts and improved employee benefits. Think about this. That’s just Round 1. Round 2 would be an ad that features Democrats making speeches on the Senate floor expressing their unwavering loyalty to DACA recipients before showing those same Democrats voting against the thing these DACA recipients want most. 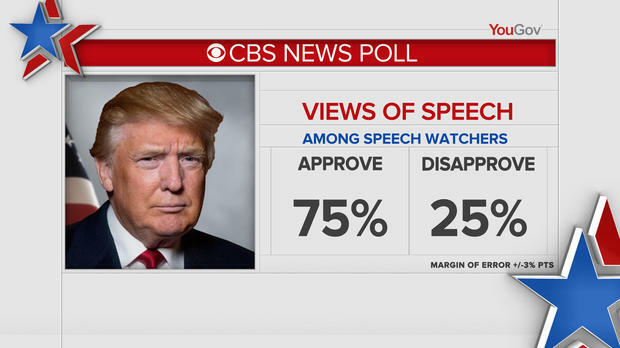 With President Trump delivering his first State of the Union Address Tuesday night, President Trump will have a nationwide audience watching. What a perfect opportunity to tell the American people his sensible blueprint for immigration reform and border security. Democrats are right. People want DACA solved. Republicans are right, too. The American people want their borders secured and chain migration ended. People rightly think that chain migration puts the immigrants in charge of immigration policy. People think that amnesty without a border wall is foolish. Sen. Schumer, welcome to God’s little acre: east of the rock, west of the hard place. Enjoy your stay. You’ll be there a while. According to CNN’s article, Sen. Schumer is looking for a reset in negotiations with the Trump administration on immigration, saying “We’re starting over. I took our thing off — they took their thing off the table, I took our thing, we’re starting over.” That’s the Democrats’ official statement but it’s meaningless. There’s no question that Sen. Schumer is facing a ton of pressure from the special interests not to cave. That’s virtually a mission impossible. Red state Democrats will almost certainly have to vote for the things that President Trump wants. If they don’t, they’ll sign their political death certificate this November. There’s no hiding on this high profile issue. With people this engaged, it’s pretty much impossible to hide. It’s decision time. This is also a sharp rebuke to Jeff Flake and Lindsey Graham. They’ve both advocated for a clean DACA bill for all intents and purposes. Technically, their bill isn’t clean but it’s a far cry from ending chain migration or building the wall. By saying this, Sanders has essentially told Democrats that they won’t take legislation negotiated by Flake and Graham seriously so they shouldn’t waste time with that legislation. That isn’t to say Republicans would be totally opposed to Graham-negotiated immigration reform. There are other squishes in the Senate. What I’m saying is that President Trump has made it perfectly clear that he won’t accept anything that Bob Goodlatte, Tom Cotton and Martha McSally haven’t approved. “There is no deal that Sen. Cotton or Rep. [Bob] Goodlatte could forge that could earn the majority of either the House or the Senate,” Schumer said, adding, “If Sen. Cotton and Rep. Goodlatte have veto power over an agreement, everyone knows there won’t be an agreement.” He said the same thing directly to the president, Politico reported. Democrats argue that this kind of GOP infighting demonstrates precisely why immigration hawks are disruptive of any attempt to arrive at a deal. If one is not reached by Feb. 8, they believe they are owed a vote on a clean DACA bill as a condition of ending the first shutdown fight, a strategic decision that did not wow liberal activists but may have been necessitated by the position of the ten Democratic senators up for re-election this year in states that Trump won as well as polling unfavorable to an immigration-driven shutdown. If this reporting is accurate, then Democrats have an uphill fight on DACA. It isn’t that DACA isn’t popular. It’s that large majorities of people also want family-based, aka chain, migration and the diversity visa lottery ended and the wall built. If Democrats dig in their heels on that, they’ll lose this fight. After reading Rich Lowry’s column, especially the closing, it’s apparent that DC Republicans don’t understand what just happened. When Lowry says “There’s still a good chance that Democrats can force a bad DACA deal, given that the GOP is divided on immigration and Trump might be tempted to sign up for anything as long as there’s notional funding for a Wall.” With all due respect, the chances of Trump settling for token funding for a wall ignores what Sen. Schumer already offered in negotiations this weekend. Once something’s offered, it’s virtually impossible to retract that offer. Further, we’ve seen proof that President Trump is perfectly willing to criticize Republicans. (Think Lindsey Graham.) Lowry should think of President Trump as a hockey goalie. Lowry should think of President Trump as the Republicans’ last line of defense. With all due respect to Lowry, nothing Trump’s done indicates he’s anything but an immigration hardliner. I can’t deny the fact that, at times, he’s impulsive. Still, he’s got enough people around him (think John Kelly, Stephen Miller and Tom Cotton) who won’t let him sign a bad deal. The shutdown was pretty lopsided. Sen. Schumer got crushed. President Trump won handily. When it comes to border security, the American people agree with President Trump. The average American wants DACA recipients protected but they also want to be protected from MS-13. They don’t want drug cartels and human traffickers leisurely waltzing across the border. They want cartel-related crimes stopped. Those dynamics favor Republicans overwhelmingly. Finally, does anyone think Democrats have a fighting chance of prevailing on not increasing military spending? Democrats will have to cave quickly on that. It’s time for Republicans to learn how to be victorious. People thought President Trump shouldn’t be taken seriously when he predicted that Americans would get tired of winning. After winning bigtime on the Trump/GOP tax cuts, then winning bigtime on the shutdown, it’s time for Republicans to realize the people aren’t with the Democrats. Last night on Special Report, Jonathan Swan and Jonah Goldberg said something that caught my attention. First, Swan said that Sen. Schumer’s capitulation (my words, not his) was a short-term victory for Democrats. Then he opined that it was a long-term victory for Democrats. Shortly after that, Goldberg said that he agreed with Swan. Frankly, I think they’re both wrong. In fact, I think they’re missing something huge that’s playing in the Republicans’ favor in terms of winning the budget fight. Both men said that Republicans had given away a major bargaining chip by giving in on CHIP. It’s indisputable that Republicans sweetened the pot for Democrats with CHIP so it’s foolish arguing that point. The point that they’re both missing is that the next deadline will require lifting the caps on the military budget. Only a tiny fraction of military units have the spare parts required to be fully ready. Training of National Guard troops is lacking, too. If Democrats think Republicans won’t beat them over the head with that during the next round of budget talks, they’re kidding themselves. Lindsey Graham is a dove on border security but he’s a hawk on defense spending. If Democrats think that they can shut down the government again without increasing defense spending, they aren’t in touch with reality. That’s a budget fight Democrats will lose if they choose to engage. After Sen. Schumer’s Monday capitulation, there’s little reason to think he’d want to drag the Democrats into another unwinnable fight. Add onto that the fact that Sen. Schumer told President Trump that he’d be willing to fund the wall during their negotiating session this weekend. Once something is offered in negotiations, it’s impossible to be taken off the table later. It’s worth noting that the American people are overwhelmingly with President Trump on ending chain migration. Mark Krikorian made an insightful statement when he said “The result is chain migration, in which yesterday’s immigrants decide who tomorrow’s immigrants will be.” Democrats will have a difficult time fighting that image. Finally, Republicans have an edge in negotiations because President Trump is a skilled negotiator, the American people are with him and he’s got the biggest megaphone on the planet. The Democrats’ losing is just beginning. It isn’t an overstatement to that that the government reopened when Sen. Schumer blinked. The final vote for cloture was 81 yeas, 18 nays. That’s the vote that ended debate and allows a final vote on the CR to fund the government. UPDATE: That bill has now passed the Senate. The House will soon vote on the bill. President Trump will likely be able to sign it late this afternoon. Appearing on Outnumbered as today’s #OneLuckyGuy, Pete Hegseth put it best when he told the ladies of Outnumbered that “Schumer blinked.” That’s exactly what happened. Sen. Schumer essentially told his far-left immigration advocates that maintaining this fight was a loser for Democrats. He essentially talked the Democrats’ special interest groups off the ledge. In exchange for caving, Sen. Schumer got promised that the Senate would vote on DACA and immigration-related issues within the next month. He didn’t get a promise that President Trump wouldn’t still push for ending chain migration and the visa lottery. President Trump will insist on those things being part of DACA-related legislation. The Senate on Monday voted 81-18 to break a Democratic filibuster on a government spending bill, clearing the way for Congress to approve the stopgap measure and end the three-day government shutdown. Democrats effectively backed off their opposition, after being given assurances from majority Republicans. Republicans, especially President Trump, now has the upper hand in these negotiations. What’s settled is that the vast majority of people want DACA recipients protected. What will get settled is that they want the wall built and chain migration ended ASAP. Now that Democrats have separated DACA from the budget, they can’t ‘re-link’ those things again. Another thing that’s got to get resolved is military spending. If Democrats are stubborn about that, they’ll lose that fight just like they lost the shutdown fight.